THE CREATION OF A BRAND NEW SPECIES IS RARE, but the coywolf seems to have evolved as a direct result of human actions. According to The Economist, forest clearing and the deliberately hunting wolves in eastern America has made life tough for the species over the past century or so. With fewer potential sexual partners to choose from, biologists believe that wolves have been lowering their standards and, out of desperation, mating widely with dogs and coyotes. And unlike most hybrid species, which rarely survive and are usually less vigorous than either parent, the ‘coywolf’ is fit. Really fit. Dr Roland Kays believes there are now millions of them across the eastern part of North America. Coywolves aren’t just a mix of coyote and wolf. Evolutionary biologist, Javier Monzón, has worked out that coywolves are around 10% dog, 25% wolf, and 65% coyote. And with DNA from big dog breeds like dobermans and German shepherds, coywolves can be twice the size of a normal coyote. Bigger jaws, faster legs, and more muscle means they can take down a small deer by themselves. They can even successfully hunt a moose if they’re in a pack. There’s a reason why coywolf territory is expanding while wolves are faring less well. According to Dr Kays, the coywolf’s ability to hunt in both preferred wolf habitat (forests) and preferred coyote habitat (open terrain) has created an exceptionally wily species. 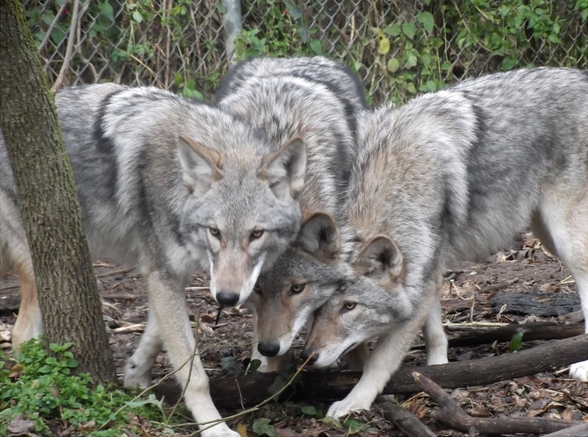 Coywolves are living in big cities like Boston and New York. The coywolf continues to expand its habitat: They’re already in Boston and Washington, and there are 20+ in NYC. It’s thought that coywolves can live in urban areas because their dog DNA makes them more tolerable of people and noise. And the animals’ diet is broader than their ancestors’ too: Vegetable patches and discarded food, rodents, squirrels… even pet cats… they’re all up for grabs.